What is China's 'magic island-making' ship? China has unveiled a new dredging ship capable of creating islands such as those Beijing has already built in the disputed South China Sea.Described as a "magical island-maker" by the institute that designed it, the vessel was unveiled on the eve of US President Donald Trump's tour of Asia. China has been accused of creating artificial islands in the South China Sea to bolster its claims over the contested waters. The strategic sea is also claimed by Vietnam, the Philippines, Malaysia, Brunei and Taiwan. 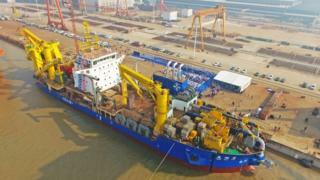 It appears to be a lot more powerful than China's current dredging vessels, and is capable of digging 6,000 cubic metres an hour, the equivalent of three standard swimming pools, from 35m below the water's surface. What does it actually do? It can dredge anything from sand and mud to coral. It cuts material out from the sea bed, suctions it up and conveys it to as far as 15km from the ship to pile it up and form new "reclaimed" land. Similar - though smaller - vessels were used to build islands in the South China Sea starting in late 2013. "The significance of this is that it could be deployed to do further reclamation in the South China Sea," explains Alex Neill, Shangri-La Dialogue Senior Fellow with IISS Asia. "The one that's really focussing people's minds is Scarborough Shoal. It hasn't been reclaimed but there were suggestions that it would be. The US though views Scarborough Shoal as a red line." The timing could be a coincidence, says Mr Neill, but it is worth remembering the considerable tension South China Sea activity can generate.The US has traditionally taken no set position in the territorial disputes, but it does assert so-called freedom of navigation operations which means it sails past or flies near the disputed islands - a strategy that angers China. This ship "has been launched with a lot of fanfare and has been called the 'magic island-maker' in Chinese media. So it could very well be a signal that China feels emboldened to move further with its South China Sea claims," Mr Neill adds. "All the US can do is [have] Trump... reassert its concern about the reclamation activities." China, however, has defied such criticism in the past and continued building islands and even placing military installations on them. What else could it be used for? Dredging vessels are used for a wide range of tasks and reclaiming land is only one of them. But the fact that Chinese state media has dubbed this the "magic island-maker" seems to suggest this will be at least part of its job. As part of China's Belt and Road initiative to build a global trading network with China at its heart, Beijing is developing a number of ports in the Indian Ocean region and the Middle East. The Tian Kun Hao can also be used to drill deepwater ports wherever Beijing would decide to send it.